'Mass graves' after Burundi attacks Jump to media player Witnesses tell the BBC about deadly reprisals by Burundi security forces after a rebel attacks on army barracks on 11 December. 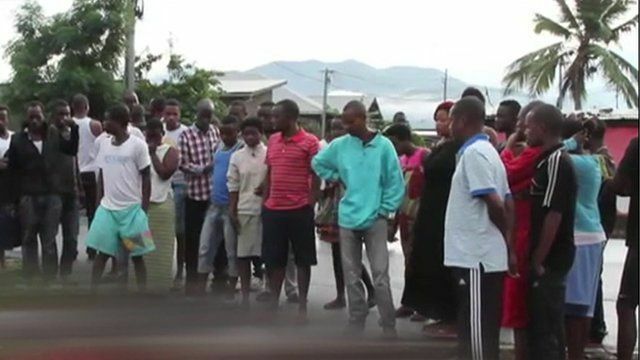 Burundi: 'Bullets through my window' Jump to media player A resident of Bujumbura, Burundi, hid from ongoing gun battles outside his home in the capital city. Dead bodies and beatings in Burundi Jump to media player Alistair Leithead reports from Burundi, which the UN warns is at risk of returning to civil war. A guide to Burundi Jump to media player As protests continue in Burundi, BBC News takes a 60-second look at the country's recent past. Hundreds have died in Burundi since the president announced he would be running for a third term last year. But evidence is emerging that many of those who died were unarmed, and that they were shot several hours after a rebel attack in December. The most deadly attack since the crisis began happened on 11 December, when armed insurgents stormed three army barracks. The government says 87 of them were killed.